A Bittersweet Finish: IBU and UB Me? In the morning, I like my coffee to taste as bitter as I feel. More often than not, I like my beer that way too. My fellow Hopheads will understand. For years breweries have challenged themselves to produce the beer with the highest ABV. Now several breweries have begun competing to produce the beer with the highest magnitude of IBU. 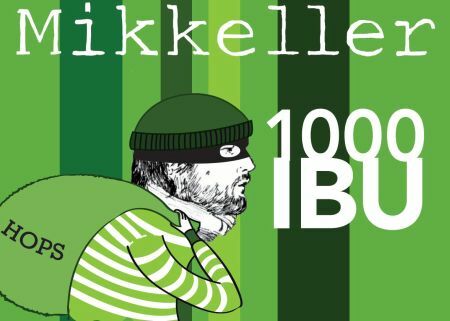 So far the Danish brewery Mikkeller has taken the lead with the juggernaut strength of 1000 IBU. Bitterness in beer is measured in International Bittering Units (IBU), which reflect the alpha acids (as measured with solvent extraction using a spectrophotometer) provided by the hops in the brewing process. However, the same level of IBU may be perceived as more or less bitter depending on the beer style. A magnitude of 50 IBU in a heavy imperial stout may not be perceived as bitter as in in a crisp low-alcohol lager. A higher IBU is often needed to balance the flavor in more full-bodied, high alcohol beers. The India Pale Ale is known for a more pronounced hop flavor than other styles, and will typically have between 40-65 IBUs. I am especially fond of double IPAs, which can be between 60 and 100+. 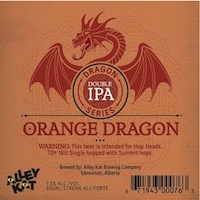 I have previously mentioned the Dragon Series by Alley Kat, a series of double IPAs each single-hopped with a different variety. The most recent release has been the Orange Dragon, brewed exclusively with Summit hops. The bitterness of a beer can add an extra kick to your cooking. This French onion soup can handle the of an India Pale Ale. I used Hop Head from Tree Brewing company, a personal favorite. A double IPA however, would undoubtedly overpower the pleasant pungency of the onions. Enjoy as I did! is know as the "crouton"
you put on top of Caesar salad. Heat oil over low heat in a heavy soup pot. Add onions, cover, and sweat until they are tender (15 to 25 minutes). Heat beef stock over medium heat and bring to a simmer. Remove the cover, increase heat to medium, and stir in the salt and sugar. Cook 30-40 minutes, stirring often, until the onions are golden and caramelized. Sprinkle in the flour; cook and stir for 3 to 5 minutes. Off the heat, whisk in beef stock. Add the beer, rosemary, and thyme. Season to taste. Return pot to range and bring to a simmer. Continue to cook, partially covered, for 40-60 minutes. When ready to serve, turn on oven broiler and toast bread rounds. Ladle soup into individual oven-proof bowls. Place a piece of toasted bread on top of soup and sprinkle generously with grated cheese. Place under broiler until melted and bubbly.